Clippinger Laboratories was dedicated soon after its 1965 groundbreaking at Ohio University under the banner of the "new Science and Engineering Campus." Times change, though, as do teaching and research needs, and by the middle of this decade the building's operating systems were far older than their original life expectancy of 25 to 30 years. Now, the first phase of an ambitious, four-phase plan to upgrade chemistry labs and related facilities has broken ground in the Clippinger Laboratories parking lot. Serving as national design and planning consultant to local architect of record BHDP Architecture, Flad has developed a 71,000-square-foot teaching and research building that provides swing space enabling the relocation of the chemistry department. 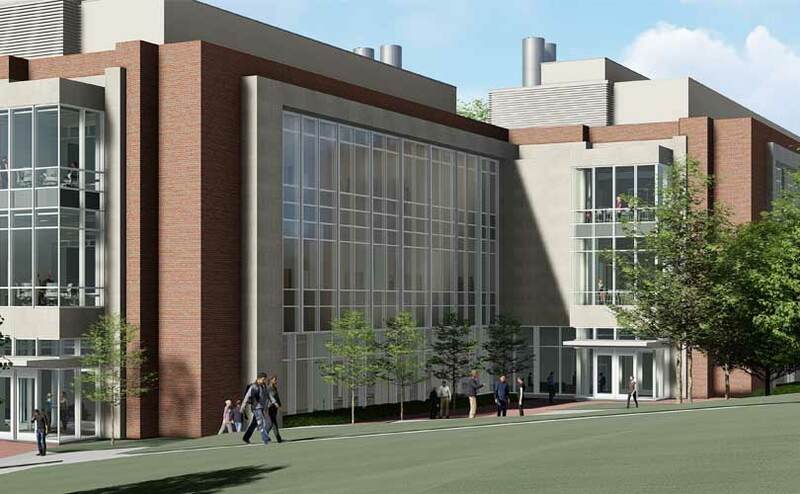 The building will house research and upper-level teaching programs, with general chemistry instructional labs to remain in Clippinger as part of future-phase renovations. The first floor is dedicated to teaching labs and core laboratory space for NMR and mass spectrometry; research in synthetic chemistry is housed on the second floor, where allowable chemical quantities are greater; and analytical and physical chemistry are located on the third floor. Each floor consists of research labs along with lab support space, faculty offices, conference rooms and collaboration areas to facilitate the needs of faculty and graduate students. The building is designed to achieve silver certification under both LEED and the WELL Building Standard. Phases two and three of the project will involve renovation and renewal of 189,000 square feet of deteriorated science space within Clippinger Hall into state-of-the-art labs, offices and support spaces. The final phase will create a new loading dock adjacent to the Grounds Maintenance Building and move programmatic space out of the ground floor of Clippinger Hall to newly renovated space in floors above. Completion of the initial project phase is slated for mid-2020, with the renovation phases concluding in mid-2022 and late 2023.